A classic beef ragu that's easy and packed full of flavour using only a few simple ingredients it's perfect for lasagne, tossed with pasta, as a filling for ravioli and cannelloni and so much more! Finely chop the carrot, onion and celery and sweat the vegetables gently in a large frying pan with the olive oil. Once the vegetables are soft add the beef and pork mince and cook until browned. If there is a lot of excess fat in the pan, drain some out. Add the red wine and reduce by half. Once the wine has reduced by half add the passata and beef stock and a pinch of salt and pepper. Serve the beef ragu with fresh pappardelle pasta, made into lasagne with bechamel sauce or stuffed into cannelloni or ravioli for a truly authentic Italian meal. 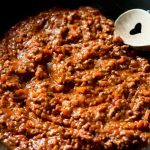 This beef ragu can be cooled then frozen. Defrost the day before using and reheat in a pan.